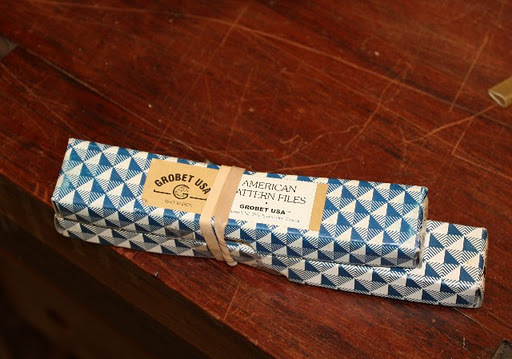 ← While my work bench lumber is being held hostage by snow ..
Last weekend, I journeyed over to Port Townsend to take Handsaw Essentials. 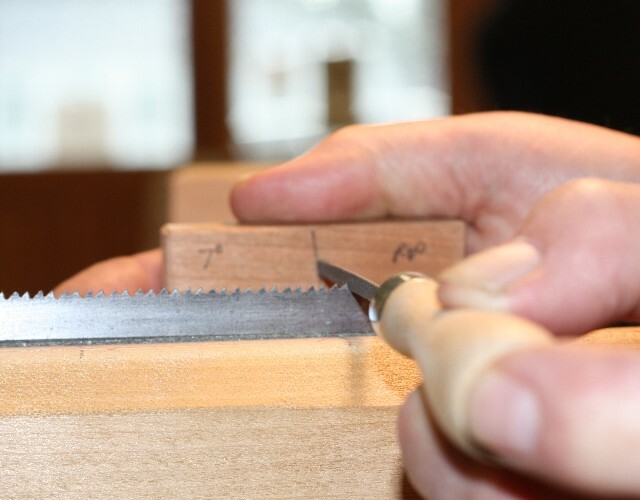 This was a great opportunity for me to get my new mitre box saw sharpened since one of the options for the class was to sharpen/restore a saw. The tooth line on the blade is about 27″ long. Thaaaat should give me some practice. So I started out by putting my saw in Jim’s cool but easy to make saw vise written about in his “The New Traditional Woodworker” book. This vise was plenty long enough to handle my blade entirely. Then I jointed the tooth line with a file and started reshaping teeth by filing perpendicular to the blade. 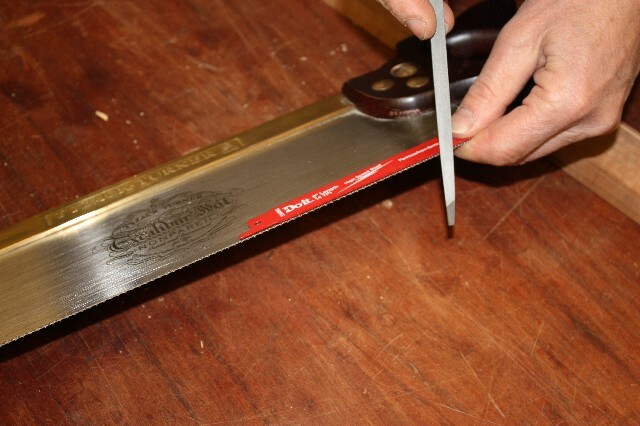 Once the teeth were established I started to put in a 9 degree rake to the teeth using a saw file guide. 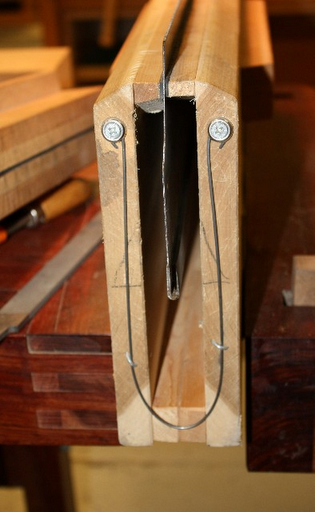 After that I put a slight set on the teeth (.2) since this saw will have a lot of teeth in the wood at the same time. Lastly, I added fleam at a 20 degree angle (see the red lines on Jim’s saw vise) with a slight upward motion to allow all the saw dust from all those teeth in the wood to escape (this is probably some what unique to a mitre box saw). Jim had a couple of suggestions if you wanted to retooth and demonstrated using a sawzall blade to use if you wanted to make the same number of teeth (7 points per inch for example). Saw files are available at amazon.com. 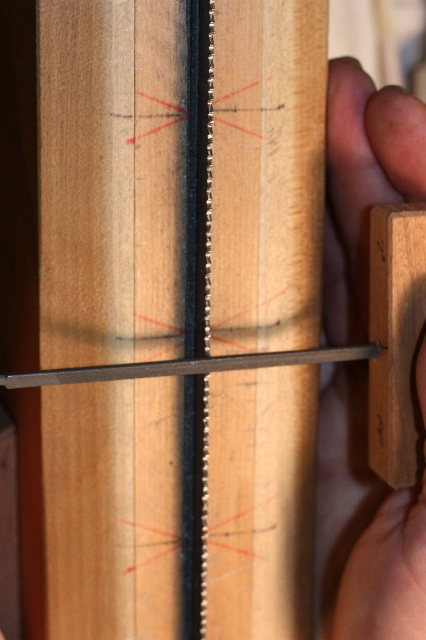 This entry was posted in mitre saw, saw sharpening. Bookmark the permalink. Sounds like a great class Marilyn! I found some re-toothing templates on the Norse Woodsmith blog that I'm using as a guide for tooth spacing on a sawplate I'm working on.Were there any suggestions on lubricating the files? Mine seemed to dull really quickly — they were Grobet from vintagesaws.com.